The 7th round of the Next Generation Scholarship Program for the academic year 2015/16 was recently closed, and the big announcement was released. Out of more than 200 applications that we have received, there are 14 winners this year coming from various universities, who now joined in the outstanding family of 138 IF scholars. After a complex reviewing process, it was about time to meet and celebrate innovation! The welcoming event for the new members of our family was a combination of good music, a cozy atmosphere, and pleasant company where each one had the opportunity to exchange ideas, share experiences, and create connections. 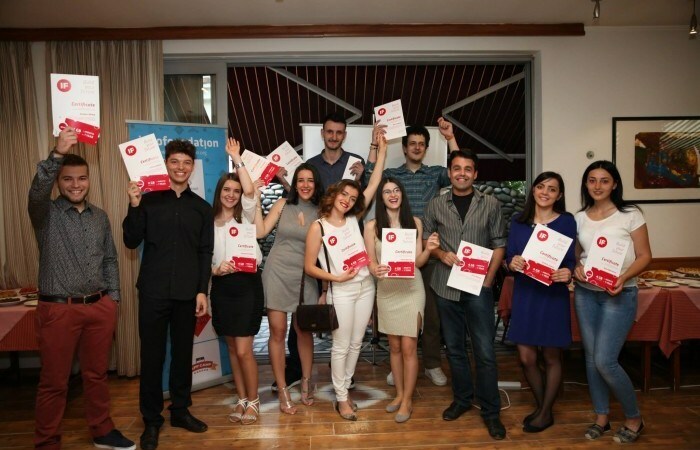 But besides socializing with each other, during the award ceremony IPKO Foundation distributed certificates for all the winners, while our supporter and partner, IPKO Telecommunications, gave a generous present to all winners – 4GB of 3G Internet each month for a year is what will connect our scholars even further to the digital world they love. We are glad and proud to have contributed once again towards the academic development of Kosovo’s youth with intellectual capacity. IPKO Foundation will continue to support, finance, and empower all the potential individuals with innovative ideas and initiatives. Do not forget: We do not invest only in education, but we give space and flexibility to innovation. There is and will always be room for beautiful minds in our family.